Welcome to our first monthly interim newsletter. The interim is the time between legislative sessions. This interim runs from mid-April to January 8th 2019. An important part of interim is catching up on our other jobs and spending time with our families, particularly in this first month of interim after a busy short session. I enjoyed the opportunity to celebrate Creighton graduation with our students and to meet their families over Mother’s Day weekend. The next weekend I got to play the parent and enjoy graduation celebrations with my older son, Nate, who graduated from Fordham University in New York City. We had a nice family trip together out to New York for the weekend and had a chance to see “Hello Dolly” on Broadway. The following weekend my younger son, Phil, graduated from Bellevue East. We enjoyed several days of graduation parties (including our own) and celebrating the accomplishments of friends and family. The interim is also a time for collaborative meetings and in-depth study on issues that we do not have time to fully explore during the session. This interim I continue my work with the Economic Development Task Force to develop priorities for economic growth and workforce development in the state. Our office is also sponsoring, and will do much of the heavy lifting on, a study requested by the US Department of Defense to examine our state licensing practices for transitioning service members and military spouses. In previous sessions we have had success passing bills to require that occupational boards consider military experience and provide temporary licensure for military spouses. Our study will examine whether these policies are being implemented effectively. Getting these individuals into the workforce as efficiently as possible is not only good for them and their families, but good for our state given our cross-sector workforce shortages. On the workforce front, an interim study that I am co-sponsoring with Senator Lou Ann Linehan involves examining improvements that could be made in our Medicaid program. We are exploring options to allow more individuals with disabilities to be able to buy into Medicaid coverage if they can work and earn money that pushes them over the eligibility limit for Medicaid. Many of these individuals want to work more and could contribute to our economy, but they are not able to meet their health needs with traditional forms of health insurance that are available from employers or the private market. A recent study shows that when Kansas allowed individuals to buy into coverage, they not only increased wages for those individuals (and tax revenues) and increased premium support to help pay for Medicaid, but the actual cost of Medicaid for these individuals went down. The ability to work up to their potential and earn more money while keeping their Medicaid to manage their health conditions made them healthier and less expensive. That study can be found here. One of the other tasks that our office works on over the interim is going over emails that have come to our office with ideas for new bills. During the session we accumulate these emails and letters and take time to return to them during the interim. If you have a bill idea, now is a good time to send it our way so we have some time to research and consider it. The Bellevue Farmers Market at Washington Park runs every Saturday morning from May 26th to October 13th. This year I will have a booth on two weekends, June 2nd and August 25th, from 8:00 am – 12:00 pm. I will also be hosting an evening open hours event on July 10th from 4:30 – 6:00 pm at the Bellevue Public Library. These three events will not have a formal agenda – I will simply be there ready to talk to whoever is interested about bills, answer questions about the legislative session, or just chat! I would be happy to see you all at one or more of those days. Hanna is a Nebraska native who grew up in Lincoln. 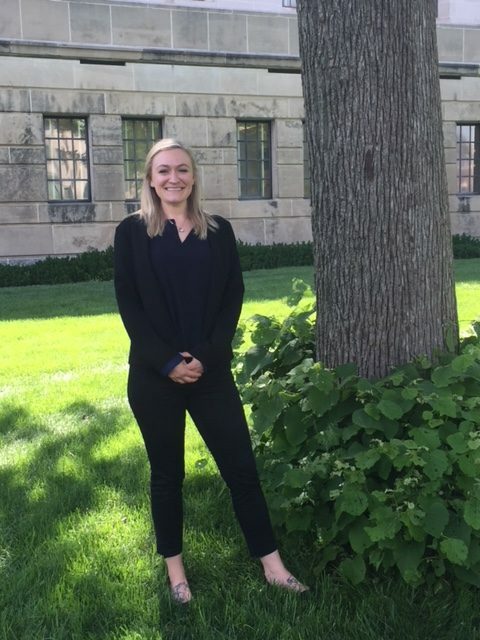 Hanna returned to Lincoln last year after living in Colorado for two and a half years, where she obtained her Masters in Social Science with a focus in Social Justice from the University of Colorado Denver. During her time in Colorado, Hanna worked as a Legislative Aide, a community organizer, and a campaign manager. Hanna received her B.S. in Psychology from Nebraska Wesleyan in 2013. Most recently, Hanna worked at the Division of Behavioral Health within the Nebraska Department of Health and Human Services. Outside the office, Hanna enjoys all things outdoors (especially hiking, biking, and camping), live music, reading, and traveling. Hanna’s responsibilities include conducting research for bills and interim studies and drafting and advising on legislation. 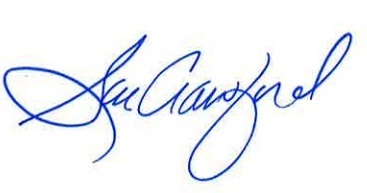 She would be happy to talk with you by phone or email. She is always available to answer any questions you may have at (402) 471-2615 or at hmurdoch@leg.ne.gov. One of my favorite parts of this job is my ability to represent the state of Nebraska at events that mark important occasions. It was an honor to attend the solemn ceremony at the Offutt Base cemetery on Memorial Day, Monday May 28th, at 9:00 in the morning. Col. Manion gave a powerful reflection on our gratitude for those who have been willing to give of their lives in service to others. At 11:00 I joined with many others from Bellevue and Bellevue VFW Post 10785 for a ceremony to honor those who have served from all branches of service. At 2:00 in the afternoon I joined with Governor Pete Ricketts, Congressman Don Bacon, Senator Deb Fischer, Senator Carol Blood, and others to celebrate Memorial Day with the veterans at the Eastern Nebraska Veterans Home (pictured below) and to honor those who have passed away in the last year. This year that included Roland Nieves, the husband of my good friend Marta Nieves. 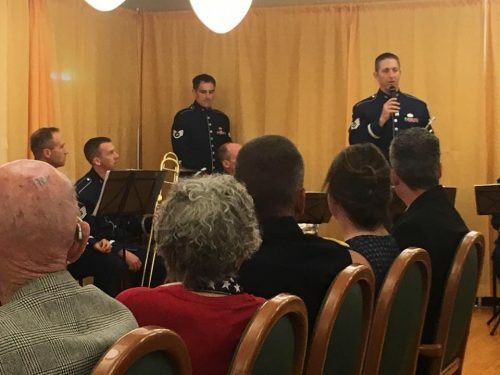 I would also like to share a music video from one of our Bellevue residents and STRATCOM professionals, Jimmy Weber. Released last week, the video (watch here) pays tribute to all the individuals who have served our country, and the sacrifices that they and their families have made – sometimes including the ultimate sacrifice of their lives. May is mental health awareness month. On May 12, the Sarpy County public defender’s office in collaboration with Lift Up Sarpy sponsored a mental health expo to provide an opportunity for families in Sarpy County to learn about resources available in our community. There was a great mix of speakers and organizations at the event to share information. Many organizations had tables set up to talk to those with questions. The organizers assure me that they plan to offer this event next year, so be watching for an opportunity to attend next May! If you have suggestions or resources that you would like highlighted in this area, contact my office and I will forward them to the organizers of the event. Suicide takes a life every 13 minutes. Know the signs – Change the stats. Each year in Nebraska there are just as many suicide deaths as traffic deaths. Suicide is the second leading cause of death for 15-34 year olds in the US. This is a crisis here in Sarpy County as well. Check out the resources available on this website for risk factors, how to help and how to start a conversation with someone who may need help. The Vet Center offers free readjustment counseling services to veterans and their families. PACT is an early intervention and prevention program to strengthen and support at risk youth and their families with in-home therapy. Youth who are age 0-19 who are residents of Sarpy, Cass, Dodge, or Douglas County qualify if they meet financial eligibility requirements. Call 402-578-5086 to refer a child or family or to get more information. 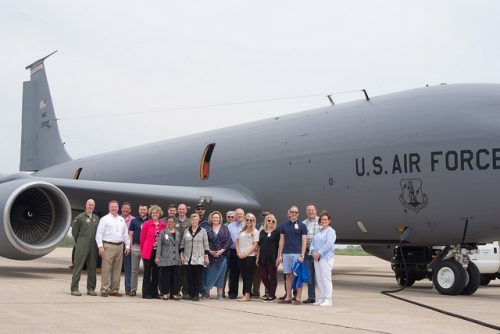 May 8th and 9th I joined Col. Michael Manion, the 55th Wing commander, and other leaders from the Sarpy County area for a two-day trip. 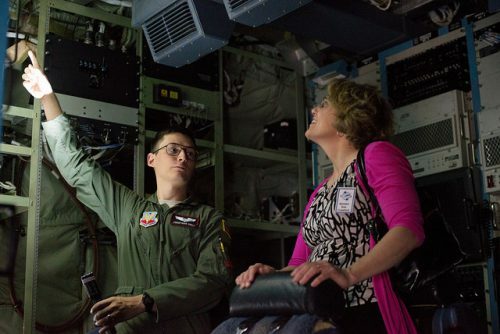 The purpose of the tour was to learn more about the 55th Wing’s geographically separated units, including the 55th Electronic Combat Group at Davis-Monthan Air Force Base, Arizona. We discussed the 55th’s worldwide mission and got to see some of the aircraft stationed there, tour the base, see an in-flight refueling maneuver up-close, and even take a crack at flying a EC-130H Compass Call aircraft in one of the base simulators. Most importantly, the trip was an opportunity to meet with some of the outstanding Airmen from both the Offutt and Davis-Monthan bases whose careers are dedicated to serving our country. It was a wonderful trip! Congratulations to the Air Force Junior ROTC Drill Team at Bellevue West for their exemplary performance at the national championship competition! The team took first place in the unarmed exhibition category and showed a national audience what it means to be both talented and respectful on the competition field. I am so proud to have these young people in our community. The Bellevue Leader has a picture of the whole team here, as well as more details about their competition experience. Congratulations again to these fine young people and their coaches! 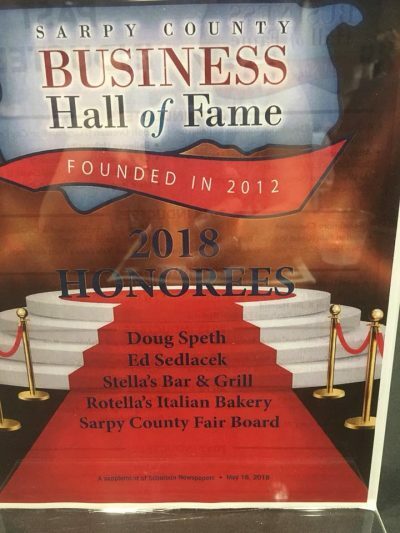 The Sarpy County Chamber held a ceremony on May 23rd to celebrate this year’s Small Business Hall of Fame inductees. One of the wonderful businesses to be honored this year was our own Stella’s Bar & Grill in Bellevue! Stephanie and her family are such an asset to our community, and they have earned every bit of support and congratulations we can give them! On May 29th the Coalition for a Strong Nebraska hosted a panel discussion about the past legislative session and how we could work with nonprofit leaders in the state to continue to improve equity and opportunities for Nebraskans. The Coalition for a Strong Nebraska includes a diverse array of nonprofit groups from the Women’s Fund and The Brain Injury Alliance of Nebraska, to the ACLU and Lutheran Family Services. The panel included Senator Matt Hansen, Senator Lou Ann Linehan, Senator Paul Schumacher and me. We had a great conversation about how we could work together. One example of a question was whether we felt that calls or emails were more effective. Our overall answer was it depends, but for all of us but one, the answer was emails as long as they are personal and thoughtful emails.